I know there are a lot of us our there now who are very wary of the chemicals contained in mainstream, commercial products. And for good reason! There seems to be very loose regulation of the chemicals used to make personal care products in the United States. When you really begin looking into some of the ingredients that are commonly used, you’ll start to wonder why some of these chemicals are even allowed in the personal care products we use! What’s the Harm in Store-Bought? The info above can be found on EWG’s website. You can also look up specific products on their site to check for ingredient safety. Not all store-bought versions of eye makeup remover are terrible. There are a few that contain minimal harmful substances. Most will at minimum have some sort of preservative, though, which is why I still prefer to make my own. If you’re going to use one from a store, I encourage you to look yours up on EWG and check to see if it would be safer to switch to a different one. 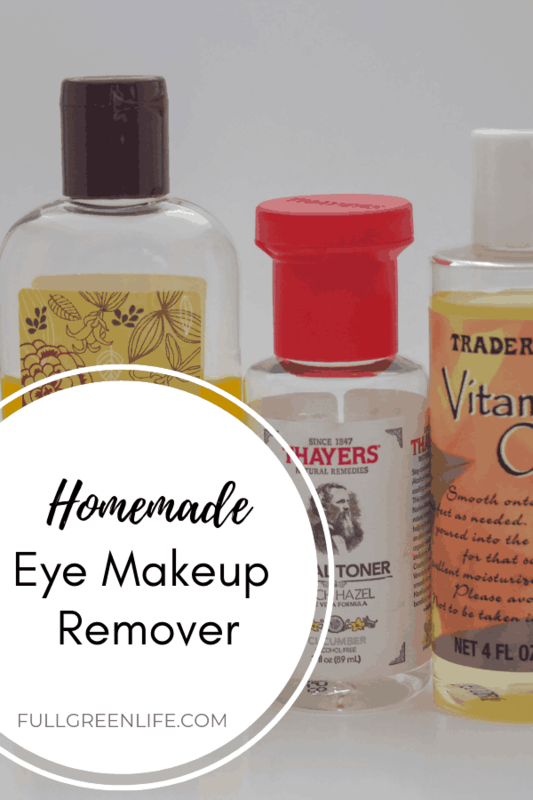 It’s very simple to mix up an effective homemade eye makeup remover that contains only a few ingredients, all of which are totally safe. 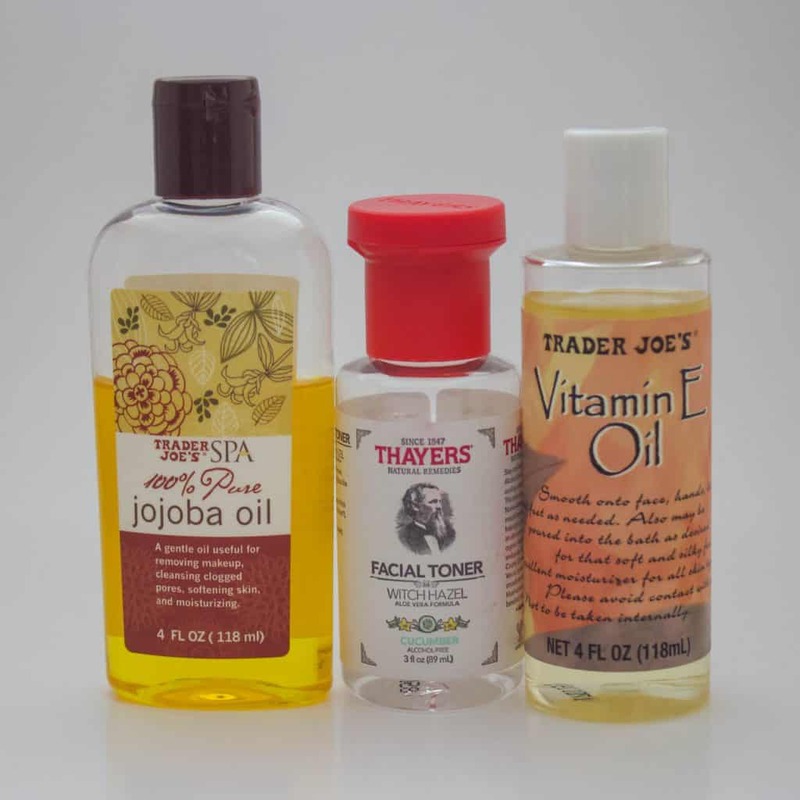 Here’s what you will need for this witch hazel makeup remover recipe. *I use liquid vitamin E oil in a bottle because I don’t have time to be squeezing oil out of those little capsules. But, capsules would work fine if that’s what you have. Add all the ingredients together into your container. Shake it up gently before each use to make sure everything is mixed together well. Just add a little of the homemade eye makeup remover to a reusable cotton pad or washcloth. Gently remove your eye makeup, and then wash with your cleanser like you normally would. How Long Does Homemade Eye Makeup Remover Last? I’m pretty cautious when it comes to products used around my eyes. I recommend mixing up only small batches that you will use up within a week or two at most. This will help ensure that the ingredients you are using around your sensitive eye area stay fresh and uncontaminated in their original container for as long as possible. This recipe makes what I need to last a week or two, but I don’t wear a lot of eye makeup. If you wear more, you can easily double or triple this recipe to make a decent amount for your needs. If you can sew a little bit, it’s pretty easy to make your own reusable makeup pads out of some cotton flannel or hemp fabric. If sewing is not your thing, though, Etsy is a great place to find a ton of handmade options. Take a look at these adorable reusable makeup rounds from the HandcraftedGoodies shop on Etsy! Once you have your reusable makeup remover pads, just keep a delicates washing bag in the bathroom and toss in your dirties. Then, throw it in when you wash your towels, and they’ll be ready to use again. It’s an easy way to cut out some of the waste in your beauty routine while you also cut out the toxins with DIY makeup remover! DIY Eye Makeup Remover is just another easy, non-toxic swap you can make to green up your beauty routine!